When an adult Eastern Indigo Snake emerges from a tortoise burrow the smoothness of its movements are nearly imperceptible. I have witnessed this in the field only a few times and it’s incredible. Slowly, the head of the snake appears at the mouth of the burrow; the snake then tongue flicks repeatedly, as if measuring the surrounding environment. Finally, as if in super slow-motion, Mr. or Ms. Indigo Snake crawls from the burrow. It’s spellbinding to watch the lustrous form of a large indigo pour endlessly from the depths of its turtle cave onto the surface and into the sunlight. A rewarding and productive Indigo field season has found me in the field constantly and all over the map. This is our third year of data collection for a field study designed to determine Indigo Snake population trends in the Altamaha River Drainage, a south Georgia population stronghold for the species. As part this study, we survey 40 different sandhills scattered throughout the river basin four times each between November–March, the prime time for locating Indigo Snakes and Eastern Diamondback Rattlesnakes at or near Gopher Tortoise burrows. 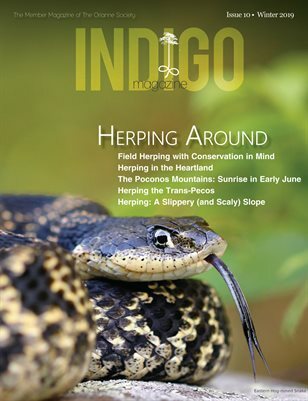 Additionally, at the Orianne Indigo Snake Preserve and a half dozen other sandhill sites in southern Georgia, I lead mark-recapture studies wherein all Indigo Snakes found are sexed, measured, weighed, and uniquely marked with PIT tags. It has sure been a great field season for finding some large and beautiful snakes. November and December were especially productive for those large male Indigos, and by that I mean seven footers and even bigger, that hunt for and lurk near burrows holding breeding females. During December, which found us bathed in abundant sunshine and above average temperatures, we found several adult Diamondbacks that, based on hefty boluses at midbody, had just taken prey. In January, I led a survey team to the wilds of south-central Florida in an effort to secure Indigo Snake specimens for a genetics study being conducted by my colleague Javan Bauder. It was especially warm in Florida, and life was “suddenly snakey”! We found Yellow Rat Snakes, a Coral Snake, Coachwhips, a stunningly gorgeous Florida Kingsnake, and a number of Indigos ranging from a two-foot-long juvenile (a hatchling of 2012) to a seven-foot-four-inch male that I found on a canal berm close to Lake Okeechobee. It’s always thrilling to recapture an Indigo marked in a previous year, and this field season we became reacquainted with many old friends. At the Orianne Indigo Snake Preserve, we recaptured Indigos “Rosemary” and “Spike”, and added new snakes to the data pool, including a spunky two-year-old male we deemed “Diggity-Dawg”. At an Ogeechee River sandridge, I recaptured “Hudson” and “Big Fella”, the latter a large, old male that we first marked five years ago. And recently, in February, I recaptured three big, healthy (all heavy with developing eggs) female Indigos; remarkably, I found two of these snakes, “Stacey” and “Alapaha”, at the very same Gopher Tortoise burrows where I first captured them three years ago. Stacey likes a huge turtle hole right next to an old windrow where a vast log pile mostly covered with blackberry bushes offers abundant security. Our Indigo field work continues for another month. Life has been pretty “herpy” lately, especially since the ground-soaking deluges that visited south Georgia in late February. Close to a sweet 16 inches of rain soaked the low country, releasing us from a serious and protracted drought. Soon, I was deluged with communiques from friends and colleagues: “Gopher Frogs bred last night at Ichauway!”; “Just found scores of new Tiger Salamander egg masses!”, and so forth. We enjoyed the croaks, grunts, and trills of over a dozen breeding frog and toad species, including everybody’s favorite, Scaphiopus holbrookii, the Eastern Spadefoot. A wet year with abundant amphibian life is always welcomed by hungry Eastern Indigo Snakes.